Koi can grow to a large size and whilst they can live quite happily in small ponds for a few years, they may eventually outgrow it. Also, in order to allow the Koi to develop good body shape by swimming against the resistance of the water and to assist in reducing drastic temperature fluctuations in winter it is advisable to have a minimum depth of 4’. Koi will tend to forage around in any plants within the pond and large Koi can damage the plants and in turn dirty the water. Most Koi ponds tend not to contain plants or if they do they are protected behind a barrier so the Koi can not get to them. 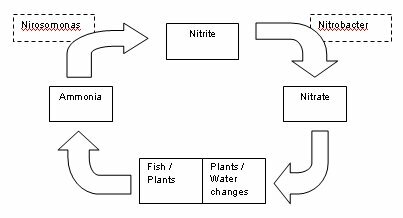 Ammonia is produced by the fish in the waste they produce and also through respiration and the breakdown of any uneaten food or plant waste. This ammonia is toxic and requires removal. The constant presence of ammonia will have a detrimental affect on the Koi and prolonged periods of high levels can kill the fish. This ammonia is broken down into Nitrite by bacteria called Nirosomonas. Nitrite is also toxic to fish. Mechanical - This stage removes all the debris and ‘solid’ particles from the water. Common methods include a vortex or settlement chamber or sieve. By removing all the solid particles from the water it not only ensures that the water remains clear so the fish can be seen but it also prevents the dirt from collecting on the biological media and preventing the bacteria from colonising. Biological - This stage follows the mechanical stage and is the area on which the bacteria form. This stage of the filter, if the mechanical stage is working properly, should not be ‘dirty’. It is important that this stage is not disturbed and whilst the mechanical stage should be cleaned on a weekly basis (some filters require more or less maintenance than this) the biological media should mainly be left undisturbed so as not to destroy the bacteria. In addition to these stages it is also common to use an Ultraviolet Clarifier (UV or UVC) this ‘light’ destroys algae in the water passing through it and helps to prevent green water. It is always better to have too much filtration rather than too little, water volume, stocking rates and feeding rates play a large part in the size of filter you need as these all contribute to the amount of ammonia being passed into the water and thus the amount of bacteria needed to remove it. Products are available which help to ‘grow’ bacteria such as Kusuri Klear, Oase Filtokick and Yamitsu Filterstart but these will not make up for inadequate filtration. There are numerous brands of Koi food on the market which offer different properties. Koi will require feeding frequently throughout the day during the summer and whilst the temperature is high can be offered protein feed. When the temperature drops wheat germ should be the sole food as it is easily digested at a time when the Koi’s digestive system is at its slowest. During really cold whether when the Koi are inactive they should not be fed.